Based In Peace River And Capable Of Serving All Of Alberta. 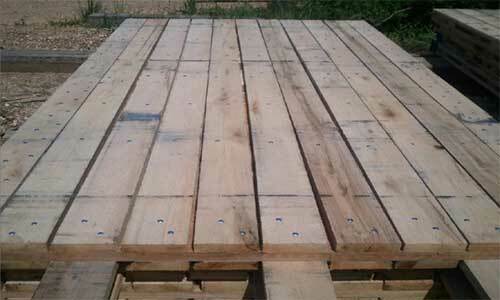 We Have A Good Stock Of Rig Mats, Spruce, Fir, And Oak Access Mats. 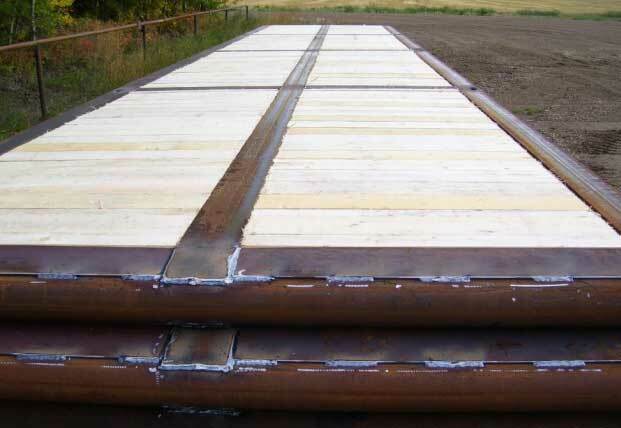 We Also Offer Pipeline Blocking And Custom Steel Manufacturing. 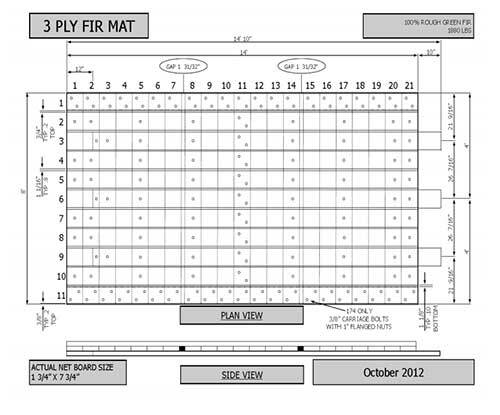 The Fir portion of our mats are custom cut for our mats. thickness and sizing will be very consistent through each mat. With the consistent sizing we have a good level surface with no tripping hazard. in the field with our mats. We use a 174 pce. engineered carriage bolt pattern for maximum holding strength per mat. the lumber. No bolt heads stick out to risk breaking. mats and can weaken the integrity of the bolt. flanged nut it adds strength to the mats. All bolts are drilled perpendicular. We have no ovaling of bolt holes, weakens mats. Over 200% greater holding surface versus the standard mats. are the most durable mat in the industry and diamond shaping in our mats is nonexistent. 22 pcs. of 14’ boards per mat. provides greater shear strength and less deflection. We are buying and using Red Oak family and White Oak family hardwood on our Mats. We feel like this is a difference maker in a lot of situations. A lot of mats we have seen out there will use mixes including Gum, Hackberry, Aspen, Poplar, Basswood among others, we DON’T allow these species. 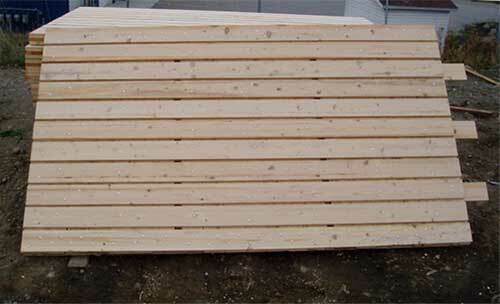 The lumber sizing will be full 1-3/4” x 7-3/4” +/- 1/8”. Our thickness and sizing will be consistent through each mat. All mats are end trimmed on site before manufacturing to exactly 8’ and 14’ lengths. Here are the criteria we use for the grade of material. We are using a very tight highline grade rule. We call for very light to no wane. 4 square edges and solid boards. We use a 174 piece carriage bolt pattern for maximum hold strength per mat. Can handle any custom mat layout required upon request. Bolts are 3/8” x 5 ½”, with a 3/8” washer and 3/8” nut. All outside boards are double bolted to keep our mats from diamonding in the field. Bolts are countersunk to insure a flat working surface and no risk of breaking in the field. getting the best mat money can buy. 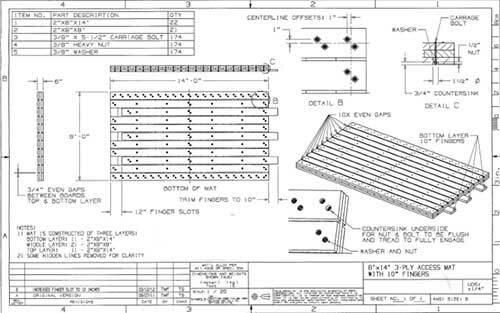 Fabrication teams are kept consistent throughout to improve quality control and efficiency which in turn delivers you a better mat at a better price. Our rig mats are filled with SPF #2 and better 6 X 6 timbers. Timbers are notched on site. Rails and crossbeams are W6 X 15 beam. Steel is stored indoors in a heated facility and all waste is recycled.